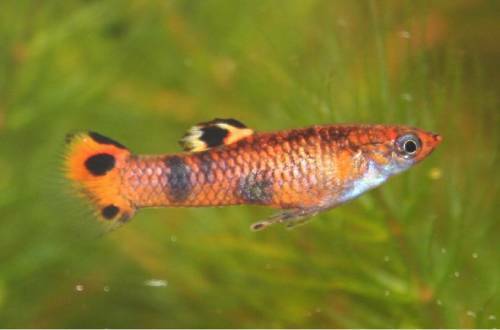 There are so many types of guppies and different guppy colors that it's difficult to list them all, and breeders are constantly working to create new guppy varieties all the time. You've likely only seen a fraction of what's available, so learn more about them. 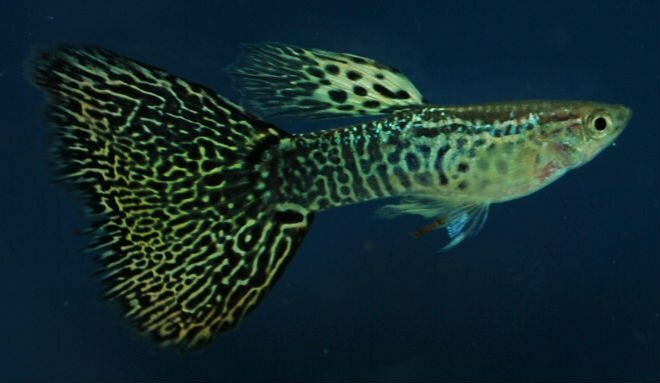 Poecilia reticulata - This is the common guppy, and this name is widely accepted as the correct name for the species, although it is sometimes referred to as Poecilia (Lebistes) reticulatus by some taxonomists. Poecilia wingei - This is also known as the Endler guppy. It's closely related to the common guppy and therefore able to hybridize with it although most hobbyists believe each species should be kept pure. These fish are not found in pet stores as often as the common guppy, but they are available. Micropoecilia picta - This is a smaller member of the Poeciliidae family that lives in brackish waters. 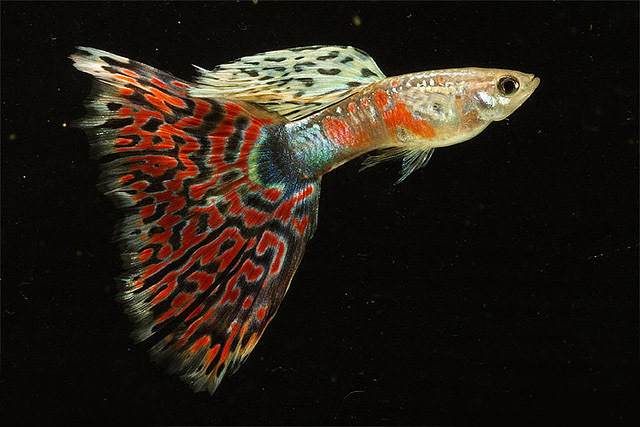 Guppies have been a favorite of hobby breeders for decades, and many types have been developed through the years. These "types" are also referred to as "strains" by hobby breeders when a particular set of characteristics begins to breed true. When you begin to mix and match all the possible characteristics that are found in these fish, it's easy to understand why there is such an incredible variety to choose from. Aside from the fact that guppies are sexually dimorphic, which means you can tell the males and females apart just by looking at them, there are three major characteristics that distinguish one type of guppy from the next. Color - This includes body color as well as fin color, since both might be different. Pattern - This includes body pattern as well as tail pattern since both can vary. Fin type - There are many distinct fin types which you can view in the chart below. Guppies come in nearly every color. Some even come in metallic colors. Metal guppies, as they are sometimes referred to, have a particular sheen because they have cells called iridophores. Iridophores are literally color cells that have no color of their own and instead reflect light off their mirrored platelets.to create an iridescent effect. 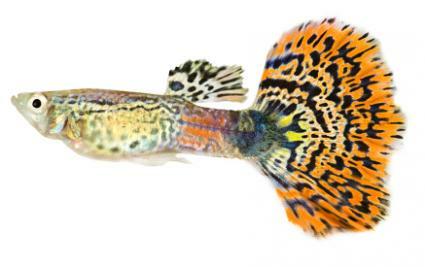 Guppies can also carry different colors on the upper and lower portions of their bodies. The upper portion of the body, which includes the head and main body, is typically a lighter color, such as a light gray. In fact, this gray is probably the most dominant body color in the species, but you'll also find some gold and platinum bodies, as well as albinos. The thinner, rear portion of the body that leads into the tail is sometimes a different color from the rest of the body. Some guppies are solid colored, while others display different body patterns. Tuxedo - In this pattern, the front and back halves of the body are actually two different colors. The light upper body color and the darker lower body color are reminiscent of a tuxedo suit, especially in the half black varieties. Cobra - This pattern includes some vertical barring as well as rosettes. Snakeskin - This pattern also has some rosettes, but it looks more like a chain-link pattern displayed across the base color. Guppy tail fins can be solid-colored, but they can also come in different patterns that make them look quite exotic. It's interesting to note that patterns often go by different names in different regions. The pattern names listed here are some of the most common. Leopard - This pattern covers the fin in a series of spots that look vaguely similar to leopard spots. Mosaic - This pattern is made up of spots that connect to one another to create a somewhat irregular pattern. Grass - This pattern is finer than the leopard pattern and is called grass because the tiny dots resemble grass seed. Lace - This is a fine, web-like tail pattern. 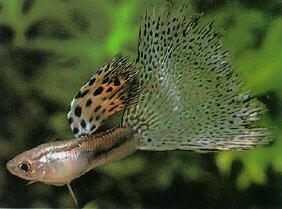 It occurs most often on guppies that carry the snakeskin pattern on their bodies. Selective breeding has led to the development of a number of distinct tail types. The chart below offers a clear view of different varieties that are currently available. Although each type of tail is labeled here, you'll still find that the same type of tail might go by a different name in another region. So much diversity is a good thing, but it can get a little confusing at times. While most guppies have dark eyes, some actually have red eyes, There are two types of red-eyed guppies. Real Red Eye (RRE) - These are normal-colored guppies that have red eyes. In most instances, they tend to be a little on the small side, although breeders are working to establish larger, more vigorous strains. 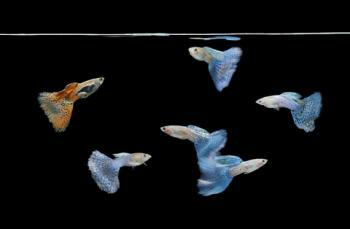 Real Red Eye Albinos (RREA) - These guppies have slightly paler red eyes, and they lack melanin, which makes them true albinos. 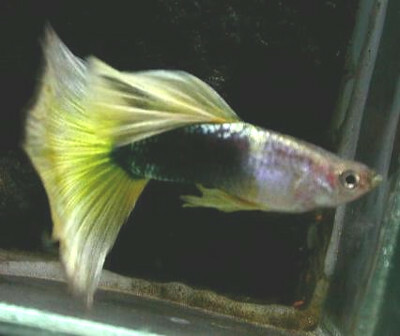 Guppies are available in every color of the rainbow, in combinations of colors as well as different patterns and tail types. When you consider the fact that all of these characteristics can be found in practically limitless combinations, there's bound to be at least one guppy that pleases the eye every individual. Whether you are interested in breeding and raising their fry, showing guppies or you just want to keep some as pets, you're going to find at least a few types that really appeal to you. Guppies are popular fish for tropical aquariums and easy to care for, so don't hesitate to give them a try.